"The Gabrielino Trail in the Angeles National Forest has been one of my favorite places to be since I first rode it in 1987. These days I spend much more time with my hands on the grips than on the steering wheel. Bicycles are freedom, mobility and health...things that make people thrive, especially in a natural outdoor setting. I see cycling, and especially mountain biking, as more than just recreation, sport, or transportation: bicycles are a key to changing lives." 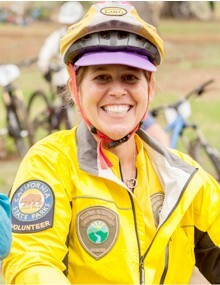 Long-time racer and advocate Jennifer Klausner has served as Executive Director of Los Angeles County Bicycle Coalition (LACBC), www.la-bike.org, since 2007, but her cycling roots are in the dirt. She explains it this way: "Riding mountain bikes, especially on my local trails, has deep personal meaning for me. I am a participant or fan of every cycling discipline, but there is something I get from riding dirt that does not come from all those asphalt and social ride miles; it's soul-riding, and truly, the reason I've carved out a career in advocating for cyclists. I am excited to apply my non-profit and administrative experience to CORBA's effort to protect and develop public access to open spaces." 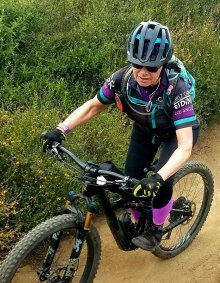 A resident of the San Fernando Valley who has been mountain biking since 2005, Wendy Engelberg is a cofounder and director or Girlz Gone Riding (GGR), an all-female group of mountain bikers welcoming all levels from beginner to pro. GGR holds skills clinics, rides, workshops, day trips, road trips, social outings, and an annual big fund raiser and CORBA membership drive every October. GGR is a non-dues club that offers an alternative to co-ed riding. It is a non competitive, social environment that empowers women of all ages. 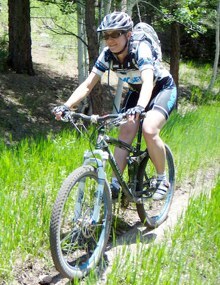 Wendy’s very 1st mountain bike ride was at the CORBA Fat Tire Fest at MCSP back in 2005. She was hooked from the start. Her 1st love is the Santa Monica Mountains, then you can find her in Big Bear when it gets too hot to ride in LA. It is my joy to be in the vast canyons either hiking or biking... and always looking for a great photograph. I have deep peace when I am surrounded by the mountains. The visual experience is breathtaking, whether I am sitting on the bench at PMO enjoying the ocean view, or when I am climbing any of the many trails and seeing the wildlife, hearing the birds and being surrounded by the incredible landscape. I have a strong sense of community; I believe strongly in all "trail people" sharing, respecting and protecting the parkland. Having a congenial and helpful disposition on the trails is my signature; having people tell me that they remember me or that I helped them find their way is the highlight of my open space experience. An advocate for our local trails and cycling community, Peter has been active in cycling since his Schwinn Stingray days in the 1970s. 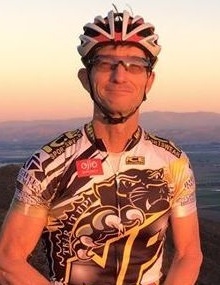 A competitive cyclist since the age of 15 and raised in the Conejo Valley, he has been exploring the Santa Monica Mountains and the Conejo open space by bike and on foot. Sharing his passion brought him to coaching in the NICA SoCal League and mentoring kids about the gifts our open space provides.